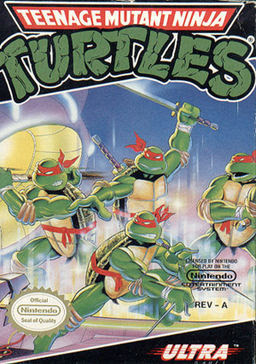 Originally created as a new cover for the second printing of TMNT (Vol. 1) #4 (recreating the original Peter Laird cover), it would eventually become one of the most reused pieces of art within TMNT merchandising. 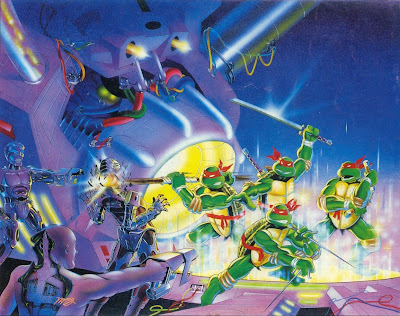 The art would go on to be used for Tiger Electronics handheld games, on cabinets for Konami's TMNT Arcade game and just about every place else. Thanks to being recycled for merchandising to such a vast extent, it's easily one of the most recognizable bits of Turtle art ever, not to mention one of the best. There's so much kinetic energy going on in that print, the art nearly leaps off the page and nunchakus you right in the face. And knowing that it was hand-painted the ole fashioned way and not with computers only makes it that much more impressive. Interesting to think they never changed the bandanas to the colors that kids knew at that time. Kinda neat the reds made it through on the cover art. Memory might be a little fuzzy, but I'm almost certain there were posters of this image, as well. I bought one of these prints from Mike a few months ago. He didn't advertise it on the blog but I asked what prints he had stocked and this was one of them. He may still have more. Thanks for the info, man! I'll see if I can hit Dooney up and hopefully he has some left (and they're in my price range). Definately a gotta have for me. I appreciate the tip, man! Homaged for the 21st Century! "Originally created as a new cover for the second printing of TMNT (Vol. 1) #4 (recreating the original Eastman/Laird cover), it would eventually become one of the most reused pieces of art within TMNT merchandising." Thanks! I guess it's a "better safe than sorry" habit to mutually credit you and Eastman together on vintage art. I made the change to the post for accuracy's sake. Neat to know the original layout and lines were all Peter's work. So cool that he responded! I couldn't help but look back onto this today in comparison with the mini-poster print version I recently had framed. My print crops off a bit of the top image and inserts the franchise name over the top. I'm curious as to whether different version of posters were released of this back in the day. As a kid, I remember having this image pasted on a humongous piece of cardboard (I drew the Ghostbusters logo on the cardboard back side for some reason). Tiger didn't have the license for the handheld game. Konami did. I own it. I still have it even though it stopped working because it just looks so frikkin cool. Konami also made a Teenage Mutant Ninja Turtles Basketball handheld game, which I also own, and it does work. I have this poster from like the late 80s early 90s i never understood it because they all had the same bandanas. Not to be arogrent but is it rare or special..